Enjoying The Course: Never, never, never! 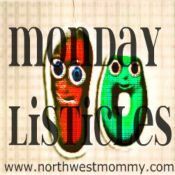 It's time for Monday Listicles! This week's challenge, brought to us by Greta, is "I'll Never...": The Top Ten Things You Said You Would NEVER Do And Have Caught Yourself Doing. 1. Go to graduate school. 3. Live in a super small town (luckily this was only for 10 months and was several years ago now). 4. Enjoy going for long bike rides. 5. Have (and love more than anything) a dog. 6. Go for a run wearing just a sports bra (well, and shorts and stuff). Ok, so this just happened once, but as I move to hotter climes, it might become more frequent. 7. Cut my own hair. 9. Be flattered by comments of how young I look. This used to bother me immensely when I was in my 20s. Now, eh, not so much! 10. Run another marathon. Training for #3 begins in less than a month! Great list. And a good thing you changed your mind on some of those - good for you! I live in an "unincorporated" town now, or as I like to call it "a cluster of houses". I don't mind it, although, I do miss the convenience of living near a city! I wish I was a runner...I'm just not built for it. I much prefer powerwalking. :) Kudos to you on the upcoming marathon! Yeay for number three marathon. You are such a rock star. And you do look very young and full of life. Sure attitude has a lot to do with it! I don't think I have ever said "I'll never be a runner", but deep down I know I am NOT runner or like running. #9 made me laugh out loud. Getting carded in my 30's made my day until my friend piped up "You're gonna feel so stupid when you see how old he really is". I don't see her much any more. Just sayin'. I've always wished I liked running. Instead, I guess I'm trying to get back into the swimming thing. Right now it's the swimsuit that's the hurdle! I've never really liked swimming much. In fact, I used to try and weasel my way out of swim class all through jr high. Good luck to you! Number 9, yes! I used to be so annoyed by my students' parents telling me how young I looked. I thought it was code for, "You're way too young to be teaching my kid." (which it might have been!) Now, I feel pleased and say thank you!